As many as 17 people, including Punjab Home Minister Colonel (r) Shuja Khanzada and Hazro Deputy Superintendent of Police (DSP) Syed Shoukat Shah, were martyred in a suicide blast on the minister’s political office in Shadi Khan, Attock, on Sunday. Reports, citing Interior Ministry sources, claimed that banned outfit Lashkar-e-Jhangvi (LeJ) has taken responsibility of the suicide attack on Khanzada. 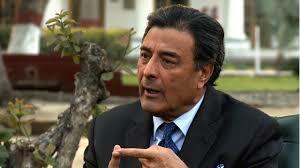 They alleged Khanzada was under threat following the recent killing of LeJ chief Malik Ishaq. 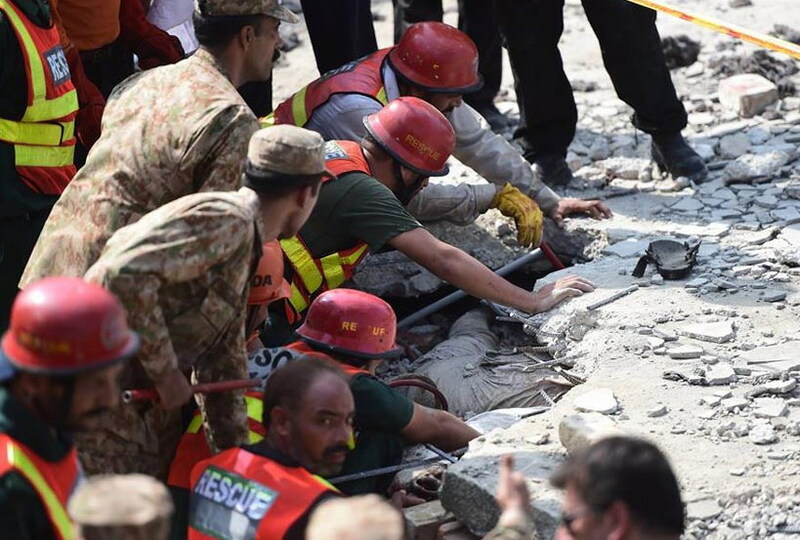 Inspecting the blast site during the day, Punjab Police Inspector General (IG) Mushtaq Sukhera said that 14 people, including the Punjab home minister, had died in the blast while at least 23 injured were under treatment at different hospitals in Rawalpindi and Islamabad. Three injured in critical condition later passed away at DHQ Hospital Rawalpindi, hospital sources confirmed, raising the death toll from the attack to 17. The driver of home minister Khanzada, Ghareeb Nawaz, was also among the dead. “There were two suicide bombers, one stood outside the boundary wall and the second one went inside and stood in front of the minister. 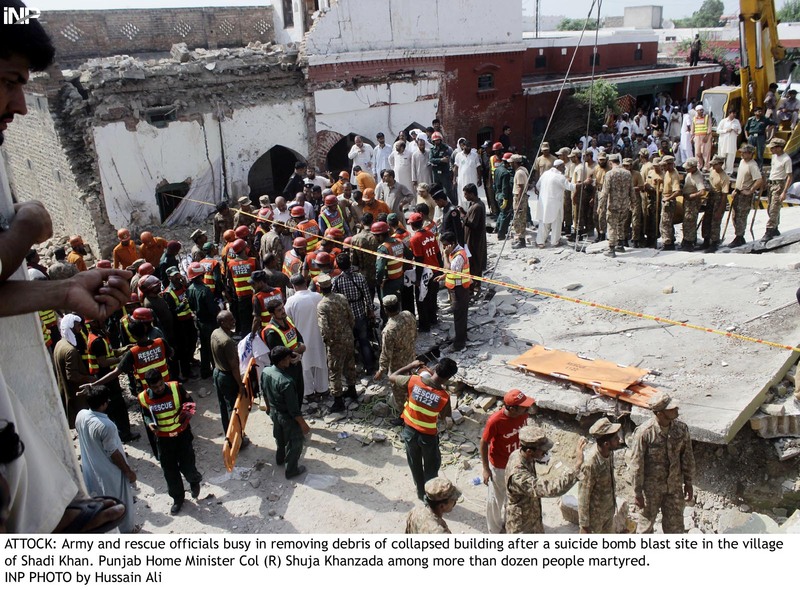 The blast by the bomber standing outside ripped the wall which caused the roof to fall flat on the minister and people gathered there,” Sukhera told the journalists, adding that police were investigating whether the attacker inside the building detonated a bomb. The top cop highlighted that the police could not rule out the involvement of banned sectarian militant outfits against whom the government had launched a crackdown. The impact of the explosion caused the roof of the building to collapse, and shattered windows in nearby houses. As many as 100 people were estimated to have been in attendance at a jirga being held at Khanzada’s political office. Many of them were buried underneath the wreckage as the entire structure had been razed to the ground by the explosion. 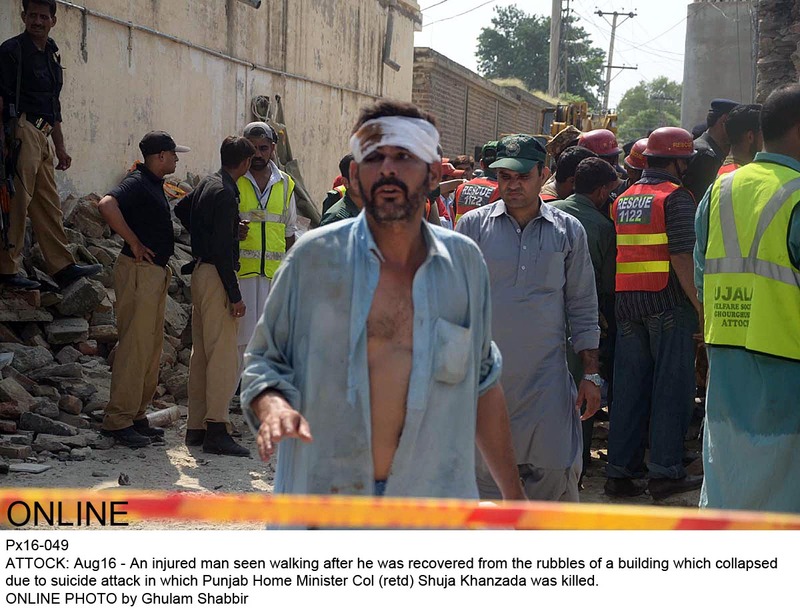 Deputy Superintendent of Police Hazro Syed Shoukat Shah was among the dead recovered from the site. 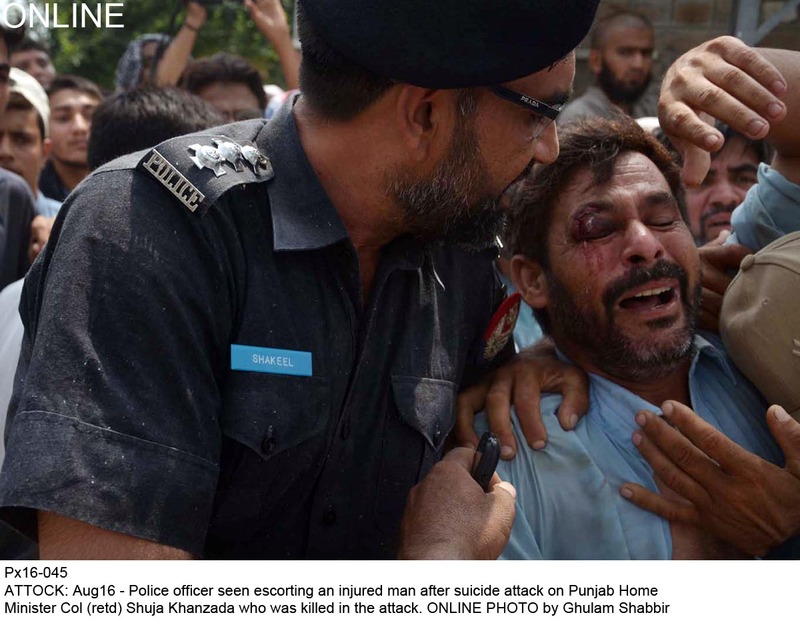 Ten other policemen who are yet to be rescued were present at the scene when the blast occurred. Later on, the deceased home minister’s funeral prayers were offered at Police Lines, Attock, along with slain DSP Hazro Syed Shoukat Shah. 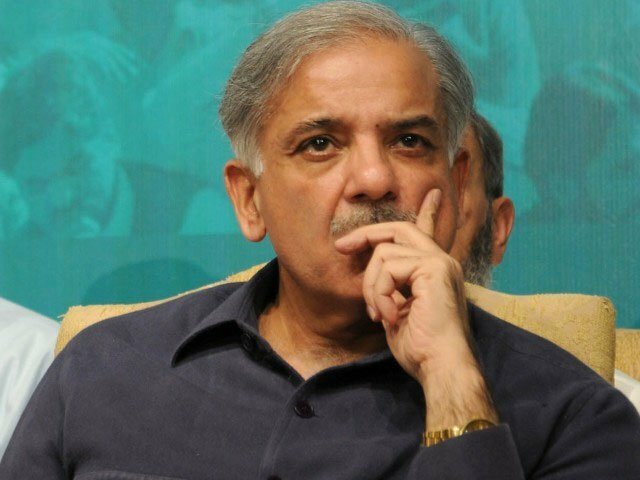 The funeral was attended by Punjab Chief Minister Shahbaz Sharif, Khyber Pakhtunkhwa Chief Minister Pervez Khattak, Federal Interior Minister Chaudhry Nisar Ali Khan and other senior officials. Khanzada was later laid to rest at his native village in Attock. Shuja Khanzada was given charge of the Home Department in October 2014 and had been actively involved in major operations against terror outfits. The provincial department he headed was responsible for the maintenance of law and order, and protection of life and property of citizens. Earlier this year, Khanzada had said the Punjab government received threat alerts for airports, prisons, schools and sensitive installations, besides targeted killing of known personalities and kidnap for ransom. The minister had said all banned organisations had been stopped from operating, and lists of NGOs and seminaries working against “national interests”, as well as a person delivering provocative speeches, had also been prepared and action would be taken against them on “solid evidence”. Minister Khanzada hailed from ShadiKhan village in Hazro, near Attock and belonged to a Pakhtun family of the Yousafzai clan. A married man with three children, he was the son of Yousaf Khanzada and was the grandson of Capt Ajab Khan, a former member of the Indian Legislative Assembly. 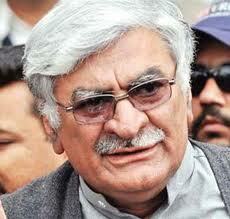 His uncle was the late Capt (r) Taj Muhammad Khanzada, a member of the National Assembly. The minister matriculated from Punjab Public School Nowshera and graduated from Islamia College Peshawar with a Bachelors degree in 1966. After joining the Pakistan Army in 1967, he took part in war of 1971 and served as an instructor/on staff appointments from 1974-1978 and again from 1982-1983. He was one of the first soldiers to reach the Siachin Glacier in 1983 and commanded the 13 Lancers Regiment from 1983-1985. A recipient of the Tamgha-e-Basalat (a non-operational military award of good conduct) in 1988, he served in Pakistan’s military attaché in Washington from 1992-1994. After retirement, he became politically active and was elected as a member Punjab Assembly 2002-2007, when he also served as Chief Minister’s Inspection Team (CMIT) minister and was a special adviser to the chief minister. He was also a member of Communications and Works and was the chairperson Special Committee No 23. Elected to the provincial assembly in 2008 and 2013, he also served on Chief Minister’s Task Force on Agriculture and Police Training Reforms as chairman. After taking over as home minister in October 2014, he remained highly involved in efforts against terrorism in the country. In addition, his efforts to provide security were called instrumental in the return of international cricket to Pakistan in the form of the Pakistan versus Zimbabwe matches in Lahore. 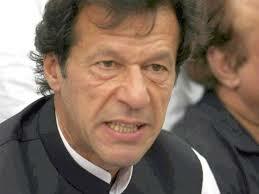 As the news of the incident spread, the country’s top officials and political leaders recorded their condemnations. 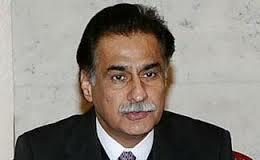 Minister for Information, Broadcasting and National Heritage Senator Pervaiz Rashid Sunday said the vacuum left by the martyrdom of Punjab Home Minister Col (r) Shuja Khanzada could hardly be filled. However, eliminating forces inimical to the ideology of Pakistan and fighting against their mindset could fill the vacuum and it would be the best tribute to the martyred brave soldier, he said in a statement. 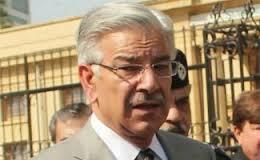 Moreover, Defence Minister Khawaja Muhammad Asif condemned the blast saying that terrorists had no caste and creed and the government was making strenuous efforts to weed out terrorism. 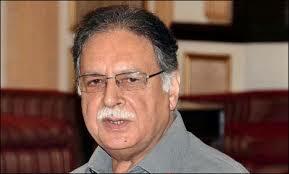 The minister reiterated that terrorism would be rooted out with an active support of the people in the country. He added that some elements wanted to sabotage development process initiated by the government through their malicious activities but their evil designs would be foiled. Furthermore, Punjab Chief Minister Muhammad Shehbaz Sharif said that he could not describe the grief over the martyrdom of Col (r) Khanzada in words. He said that Khanzada was a close companion of him and his sacrifice in the war against terrorism will not go waste. 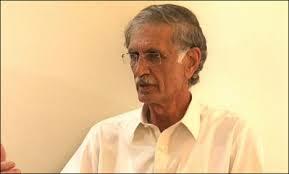 Khyber Pakhtunkhwa Chief Minister Pervaiz Khattak and KP Information Minister Mushtaq Ahmad Ghnai also expressed their heartfelt sorrow over the killing of Punjab home minister. National Assembly Speaker Sardar Ayaz Sadiq, Deputy Speaker Murtaza Javed Abbasi, provincial Ministers Raja Ashfaq Sarwar, Chaudhry Sher Ali, Bilal Yasin, Syed Haroon Sultan Bukhari, Malik Iqbal Channar, Atta Muhammad Maneka, Khalil Tahir Sandhu, Dr Farrukh Javed, Hameeda Waheeduddin, Begum Zakia Shahnawaz and Parliamentary Secretary Information & Culture Rana Arshad Jutt have also expressed deep sense of sorrow and grief over the martyrdom Khanzada. 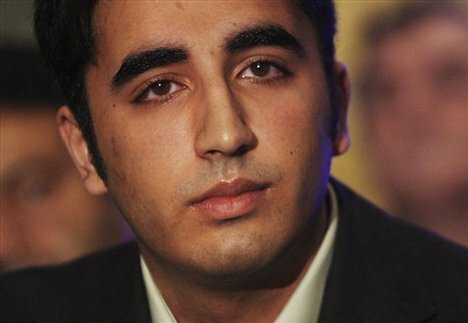 Condemning on the incident, Pakistan People’s Party (PPP) Chairman Bilawal Bhutto Zardari said cowards’ attacks cannot lower the high morale of the nation as entire country has risen up against the terrorism. He prayed for those who lost their lives in the Attock attack and for early recovery of the injured. Awami National Party Central President Asfandiyar Wali Khan also condemned the blast demanded of the Punjab government to arrest those involved in the incident. 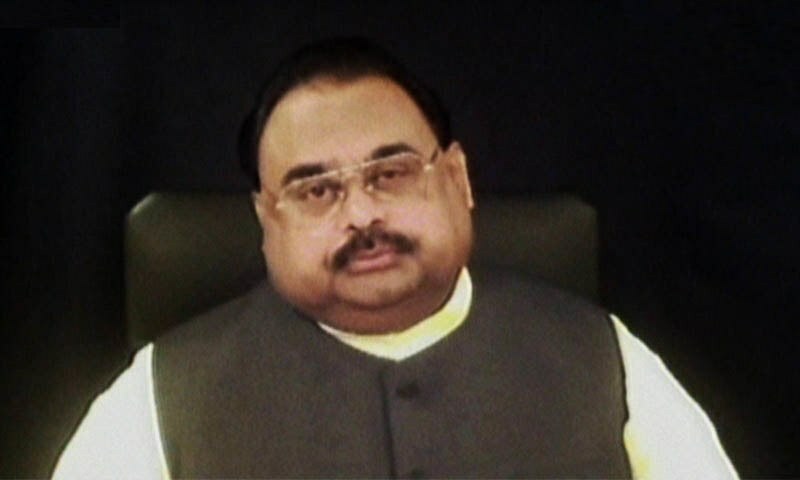 Moreover, Muttahida Qaumi Movement (MQM) chief Altaf Hussain has termed the incident as a “national tragedy”. In a statement issued from London on Sunday, Hussain said that this tragic incident has not only left the people of Punjab sad and grieved but equally all the peace loving people of entire country. The manner in which the suicide bombers carried out the attack shows that the terrorist still have the capacity to strike at their will and target innocent citizens at place of their choice. Furthermore, Pakistan Tehreek-e-Insaf (PTI) Chairman Imran Khan said that Khanzada was the founder member of the party who in the early days travelled with him to galvanize people. Imran Khan expressed deep grief and sorrow over martyrdom of Shuja Khanzada, declared him brave soldier and politician and announced that PTI will not put candidate for by-election in said constituency. Besides praying for departed souls to rest in eternal peace, the chairman PTI also prayed for earlier recovery of those injured in the blast.